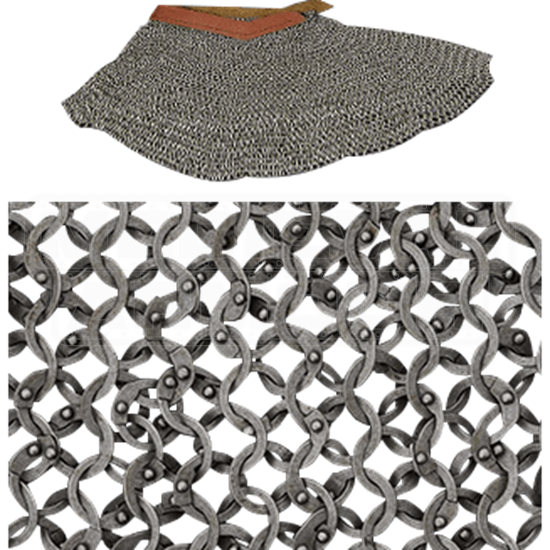 Connecting to the helmet, an aventail, or camail, guards the vital area of the neck and shoulders with a curtain of chainmail. 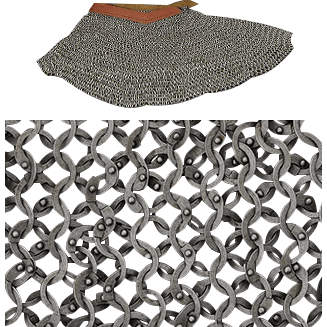 The Earl Grade Chainmail Aventail uses a leather band to attach to the base of a helmet. Aventails gained popularity in place of the mail coif by the late 15th century. This style of dome-head riveted mail is reasonably authentic to the early medieval period, particularly in the European flat ring version. This construction style has the advantage of strength, allowing it to be used for supervised weapons-contact re-enactment, while being more economical than wedge-riveted mail. This item is crafted from 17 gauge mild steel. Construction is in the 4 in 1 pattern.